Agape House - "Our Belize Vacation"
Located at the water’s edge Agape House and Agape Villa both have spectacular views of the Caribbean Sea. Our dock allows you to sit right on the water, enjoy a swim or throw in a pole. The yard is white sand and coconut tress. 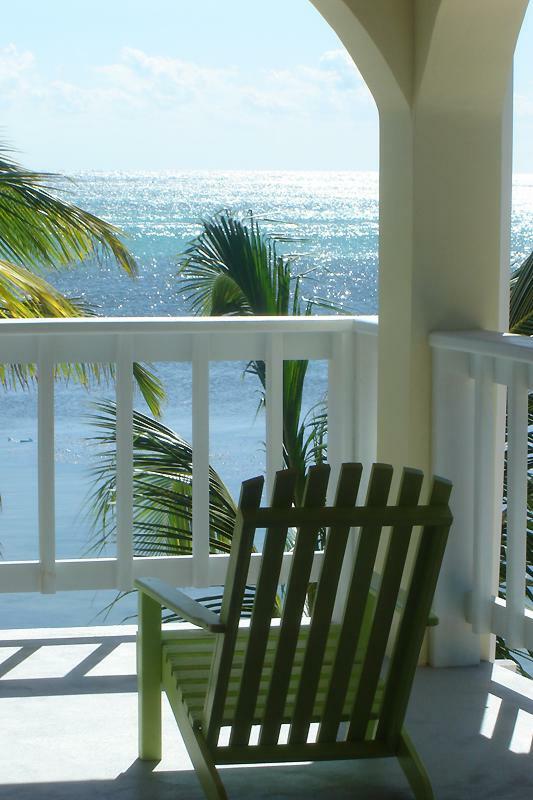 We believe this is the prettiest section of Ambergris Caye. Scuba, fishing and snorkeling can be arranged by phone from Agape. The guides will pick you up at our dock. Agape House and Agape Villa are located 1 mile north of San Pedro in an area of private homes. It is a great escape! Golf carts, bikes and boats are the means of transportation on this part of the island. We are far from the bustling streets of the town yet close enough to walk to San Pedro. Enjoy morning sunrises over the sea or the afternoon fading into twilight as stately palms whisper in the breeze. 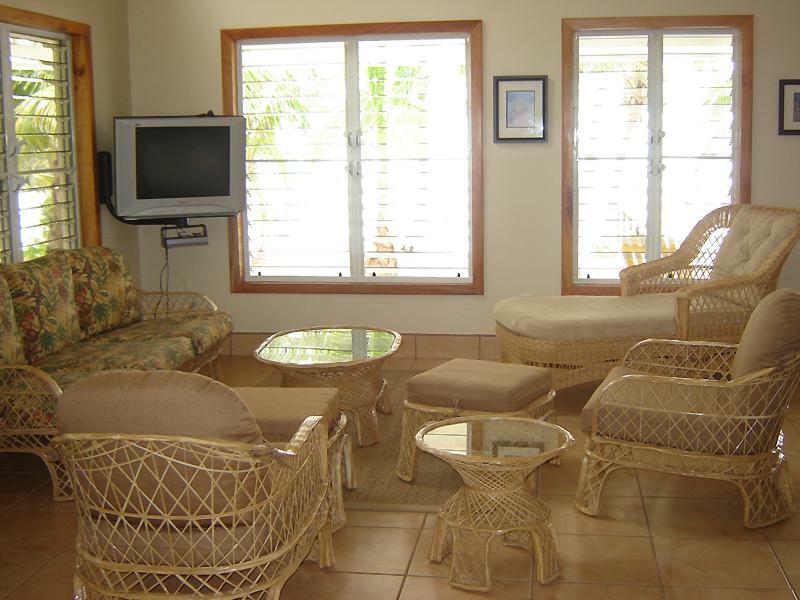 Outdoor life here is relaxing and easy as you watch frigate birds, pelicans, herons, egrets and osprey. 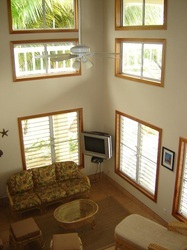 You might see dolphins feeding and bonefish tailing in front of the houses. The night sky is so clear that you will see the Milky Way and shooting stars as you listen to the sea lap gently against the dock. Agape House and Agape Villa luxury vacation home rental will easily accommodate 8 guests. At every turn you’ll find striking views, comfortable furniture, and large windows that admit cooling breezes. Agape was designed for comfort, relaxation and easy living. Agape House, located 50 feet from the water’s edge,combines luxury with comfort. The house offers 2 bedrooms. 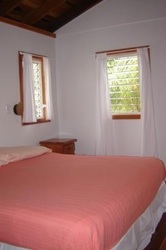 Both bedrooms have air-conditioning, comfortable beds, exotic hardwood floors, ceiling fans, private baths and balcony. The master bedroom has a king bed and the second bedroom has 2 twin beds. The living room, with its vaulted ceiling, is perfect for relaxation with comfortable furniture, cable TV , and Mexican tile floor. 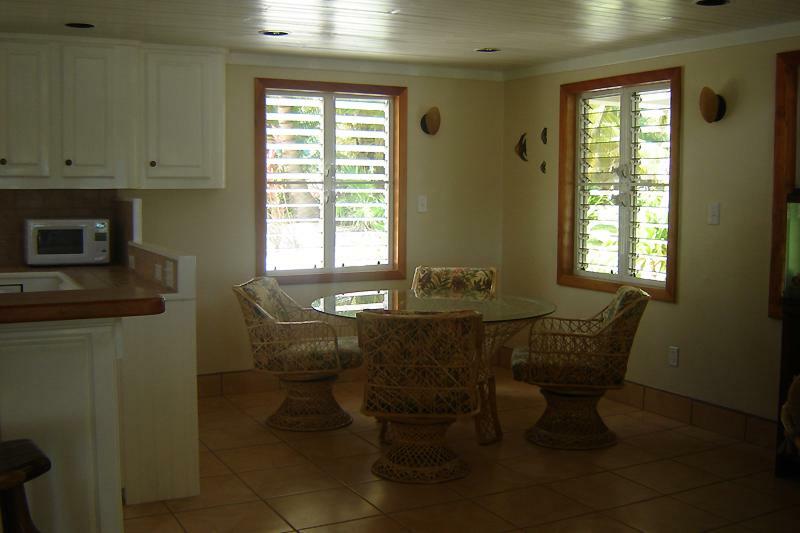 The dining area is ideal for games and conversation as well as eating with its cushioned captain's chairs. Our modern, fully equipped kitchen is a joy to cook in. 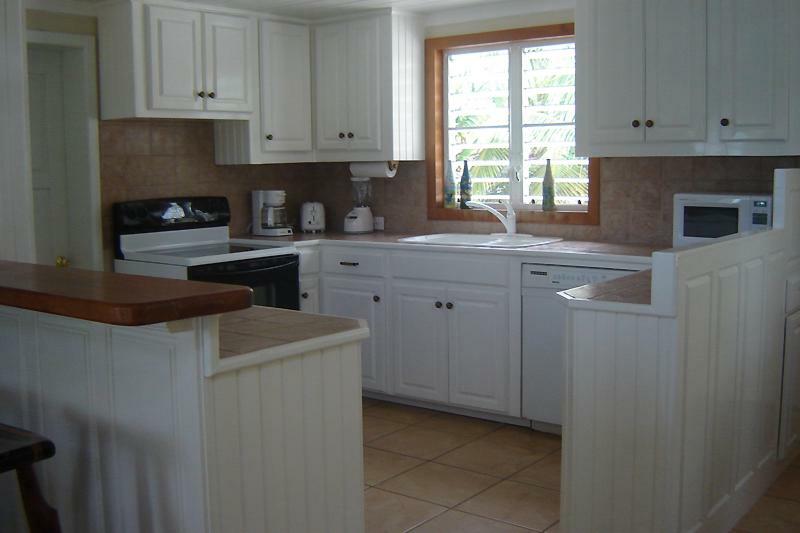 Where else can you chop vegetables and have a view of the Caribbean Sea right out your windows? Our 2 exterior decks provide up to 1200 square feet of pleasurable outdoor living; panoramic views are everywhere. Agape Villa offers 2 bedrooms., each with comfortable beds, private bathroom, air conditioning and ceiling fan. The master bedroom has a king bed and the second bedroom has 2 twin beds. 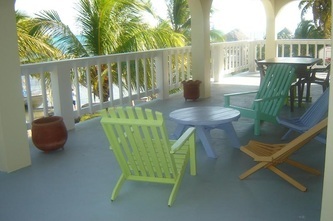 Agape Villa has a spectacular view of the Caribbean. 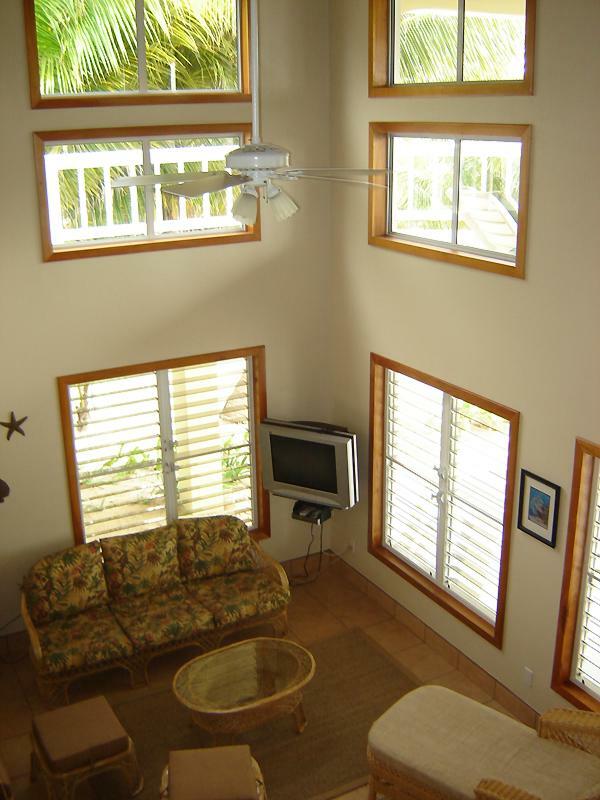 Large windows and vaulted ceilings make the villa light and airy. Exotic hardwood ceilings and floors lend to the luxurious feel. Lovely living room, with comfortable and attractive furnishings, ensures a relaxing stay with cable TV and telephone. Dining area has stunning views with large table and comfortable captains’ chairs that are perfect for meals, games and conversation. Full modern kitchen in lovely mahogany cabinetry has everything you need to cook a perfect meal.